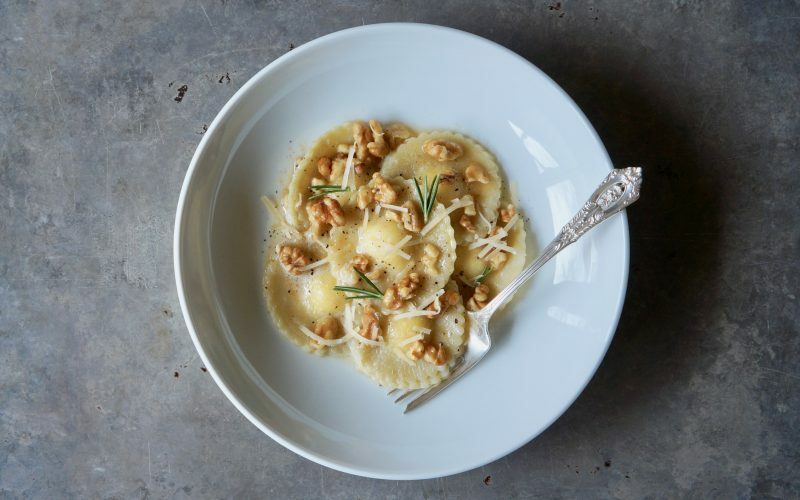 Walnut-Browned Butter Two Cheese Ravioli is a wonderful dish that highlights the procedure of preparing ravioli from scratch. 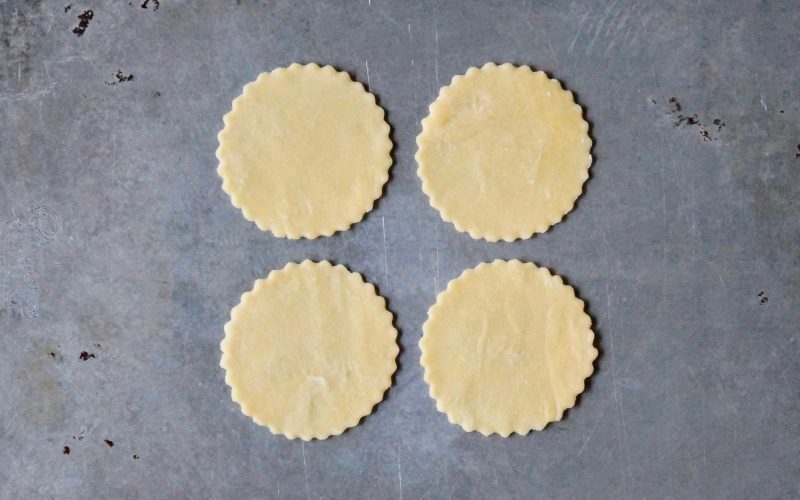 Once the Classic Pasta Dough has been rolled using a pastry pin, it may be portioned with standard cookie cutters. A bit of egg wash is swiped over the surface then they may be filled & topped with an additional circle of dough. Homemade ravioli cooks quickly. Look for them to float to the surface of the pasta water to indicate that they are ready. 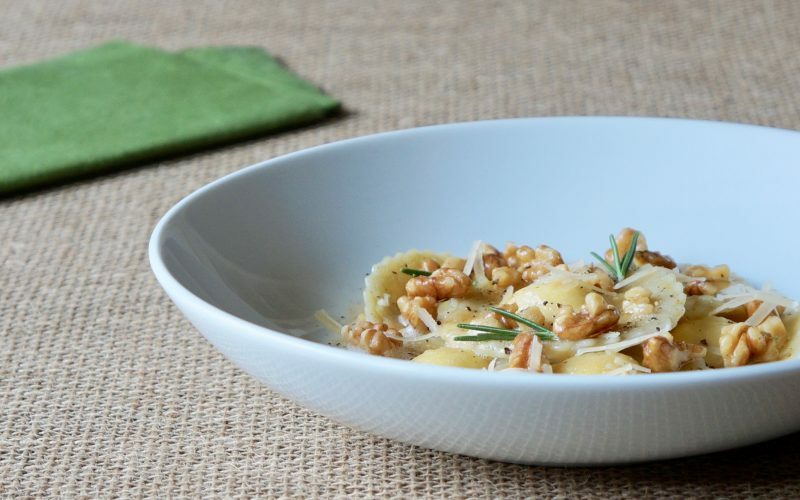 A simple sauce of browned butter accompanied with fresh rosemary & walnuts is all that is needed to highlight the simplicity flawlessly. 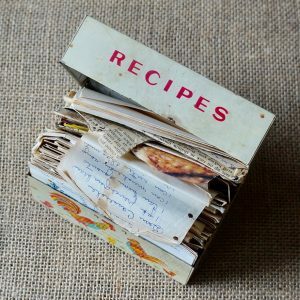 Learn how to make a lovely dish ideal for a weeknight dinner or when entertaining guests in your home. Prepare the Classic Pasta Dough as directed. Combine the ricotta, the Parmesan, the salt, the nutmeg & a bit of pepper in a small bowl. Transfer to a piping bag. Chill. 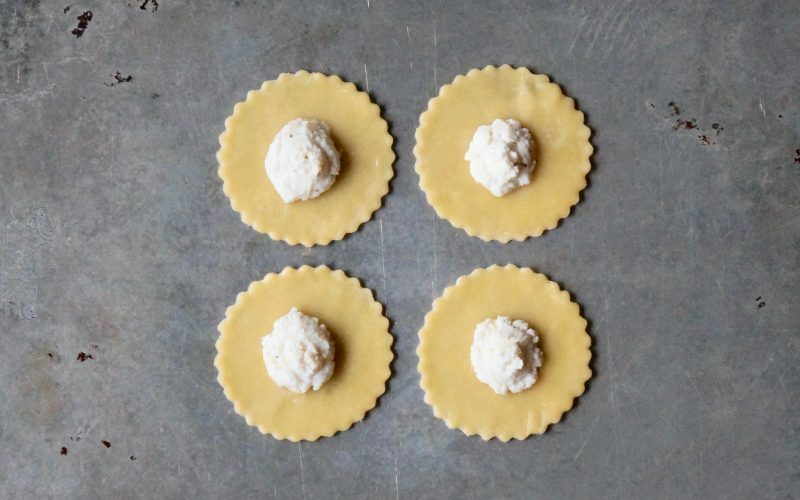 Roll small portions of the pasta dough to a 1/16-inch thickness using a pastry pin on a lightly floured surface. Keep all dough not in use covered during the process to keep it from drying out. You should be able to see through the dough when it’s ready to cut. Portion the dough using a 2 1/4-inch round cutter. Swipe the surface of half of the circles with the lightly beaten egg. Cut the end from the filled pastry bag using scissors. Pipe 1 teaspoon of the ricotta mixture in the center of each circle. Top with the remaining cut circles & press around the filling pushing any air out to seal. 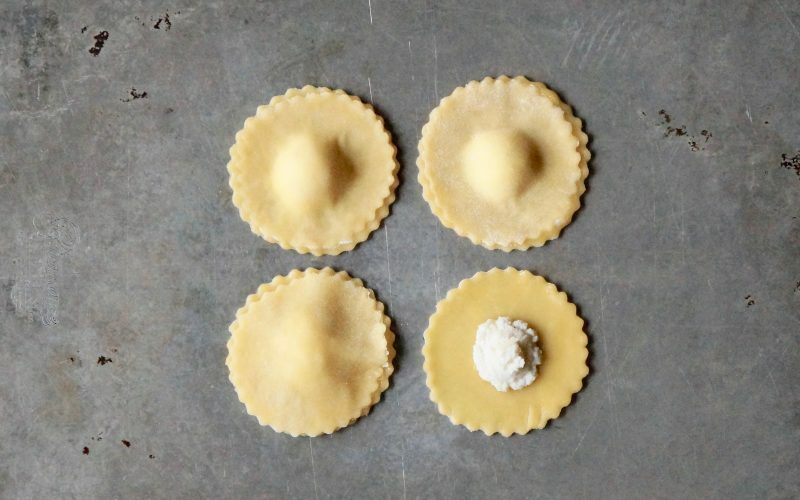 Place the ravioli on a lightly floured half sheet pan & cover well with plastic wrap up to 1 day. Bring 3 quarts of water with a pinch of salt to a boil in a Dutch oven over Medium heat. Add 6 to 8 ravioli at a time & cook, stirring occasionally, 2 to 3 minutes. Remove them individually using a slotted spoon & transfer to individual pasta bowls. Melt the butter in a large sauté pan over Medium heat. Once it begins to bubble, pick up the pan & swirl it around. Place it back on the heat & cook 1 to 2 minutes. As the butter continues to cook & brown. Pick the pan up several times during the process & swirl it around for an even color. The butter will foam during the process. Add the walnuts to the browned butter, then evenly portion the mixture over the cooked ravioli. Garnish, if desired. Whisk together the flour & the salt in the bowl of a heavy duty stand mixer. Make a well in the center & add 3 eggs & the oil. Blend on Low speed using the dough hook attachment until the ingredients combine into a mass, about 1 minute. Stop the mixer & transfer the dough to a floured surface. Fold the edges to the center. Knead the dough 2 to 3 minutes or until smooth & elastic. The dough should gradually spring back when pressed in the center. Roll the dough into a flat disc & wrap in plastic. It will feel heavy in your hand but when pressed around the edges, springy & light. Let stand at room temperature 30 minutes. 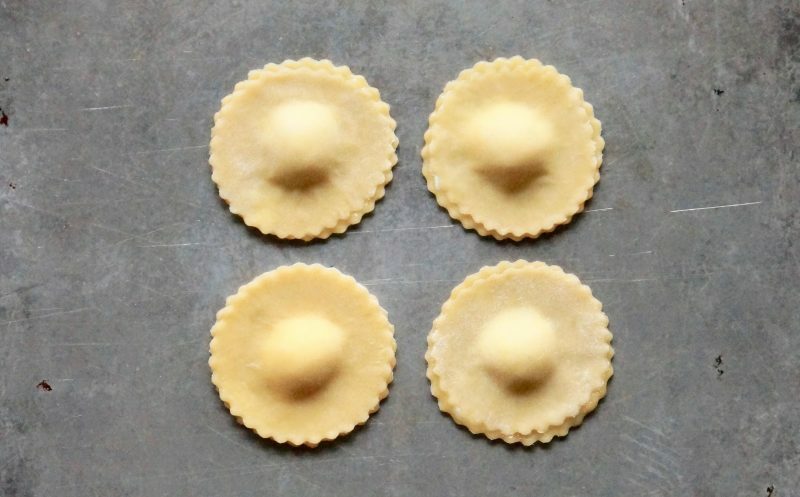 The technique for making homemade ravioli is simple. If you’ve prepared handpies, it’s quite similar. The key is to roll the pasta dough as evenly & as thinly as possible– you should be able to see the work surface through it. 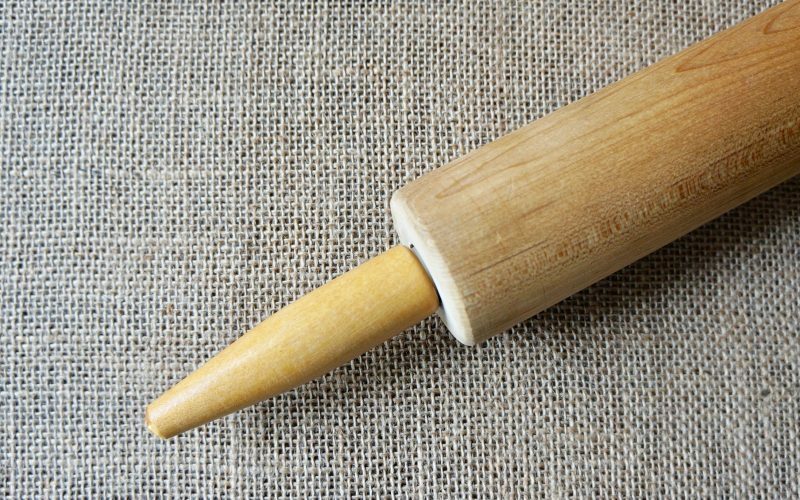 Roll small portions of the pasta dough to a 1/16-inch thickness using a pastry pin on a lightly floured surface. Keep all dough not in use covered during the process to keep it from drying out. You should be able to see through the dough when it’s ready to cut. Portion the dough using a 2 1/4-inch round cutter. Swipe the surface of half of the circles with the lightly beaten egg. Prepare the ricotta filling as directed. Cut the end from the filled pastry bag using scissors. Pipe 1 teaspoon of the ricotta mixture in the center of each circle. Top with the remaining cut circles & press around the filling pushing any air out to seal. 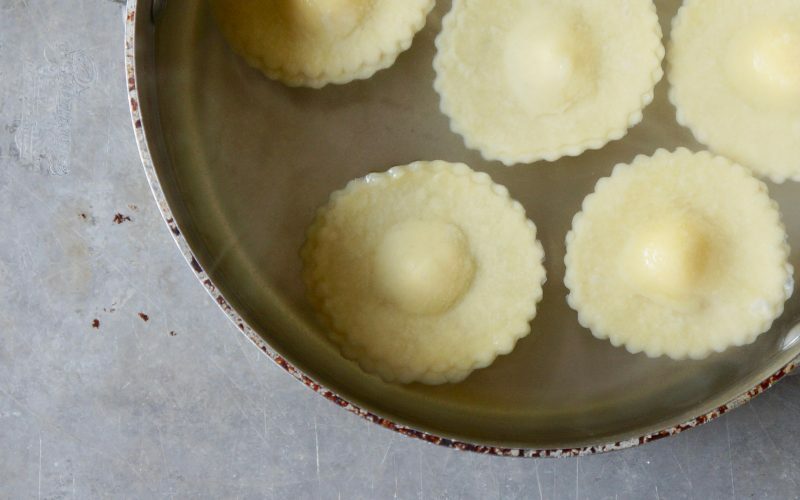 Place the ravioli on a lightly floured half sheet pan & cover well with plastic wrap up to 1 day. Cook the ravioli as directed according to specific recipe applications.